In today’s hurried times we often forget one of the things without which we cannot imagine life – food. To make time in the office and during your business trip, take a trip to a restaurant or simply sit down for a while and enjoy the tasty food in peace, unfortunately, it is becoming more and more time luxury. 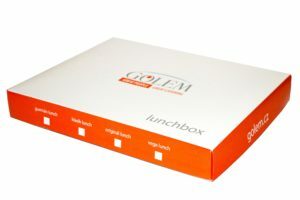 Golem catering therefore offers an alternative that is just right for these occasions, when you simply do not manage. Contents Lunch boxes can be freely combined with each other at will. Another advantage is work, which is practical just by the fact that in addition to a delicious menu, it also includes a cutlery and a napkin. Note. If you are interested, you can order a Lunch box with your own graphic design and have it made. Who says you can enjoy good food on a plate? 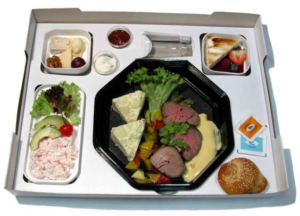 Try the “Gourmet” Lunch Box to please the gourmet taste buds. Is there a cocktail of shrimps, avocados and red grapefruit or just a delicious apple strudel with vanilla sauce? Lunch box “Classic” will never go out of fashion. Get off the line and let yourself be drifting on the waves of taste. Lunch box “Original” gets you for example with delicious sushi set (Nigiri 2 pcs, Nori maki 4 pcs, Oshi 2 pcs, Soy sauce Kikoman, pickled ginger Gari, Wasabi). At Golem catering, we respect those who voluntarily choose not to consume some animal products or simply do not like them. The Lunch Box “Vegetarian” is therefore designed to satisfy even the most demanding gourmets.